It’s that time of year again. Friday, June 26th is the 17th annual PSI’s Take Your Dog to Work Day®! Yep, it’s a real holiday, well—sort of. It was started in 1999 by Pet Sitters International to highlight how dogs benefit our everyday lives and to promote pet adoption. Sounds like a great idea, right? 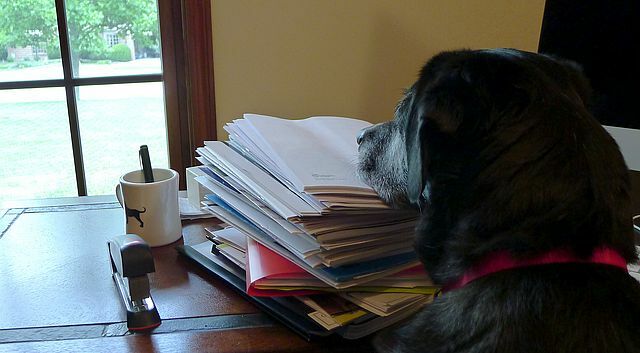 But what if your company doesn’t participate or has never heard of Take Your Dog to Work Day? Before I started blogging, I wasn’t able to take Haley into the office where I worked. I often wondered how far I might get if I tried to sneak her into the building before someone might say something. I even imagined throwing her ball down the long, carpeted hallways; she would have loved playing fetch in those hallways after hours! I’m sure she would have received a lot of love from my co-workers and other people in the building, but I’m sure she (and I) would have gotten a few disapproving looks too. Not everyone loves dogs as much as I do and occasionally someone out there reminds me of that fact. I understand, there are people that simply don’t like dogs, others may be allergic to dogs and some individuals just reject the principle of dogs in the workplace because, well—they just do! My son and daughter-in-law live in San Francisco where most people don’t give a second thought to seeing a dog in an office or other places of business, but here in the Midwest, it’s rare to see workplace pets other than service dogs or a random cat in a flower shop or bookstore. I had to laugh while watching a recent episode of Silicon Valley when a candidate was interviewing for a job and insisted on a dog friendly workplace including the right for his pup to use the pool. Maybe attitudes are changing. It’s wonderful that some lucky individuals have the option of taking their dogs to work each day. I wish I could’ve had the freedom to do that with Haley instead of leaving her home alone everyday. She would’ve loved the attention and ability to socialize with different people, but I wonder what she would have done when it was time for me to focus on work. Would she have complained with her “It’s time to go and do something fun” whining routine? I’m sure she would’ve settled down for a nap at times but I’m also sure there would have been plenty of requests to go outside and sniff around just because she was bored. You don’t expect me to do any real work, right? I’m hoping the trend of dog-friendly businesses continues to grow and more dogs have a chance to at least occasionally visit their owner’s workplaces. When businesses participate in Take Your Dog to Work Day, they have the perfect opportunity to test the concept of pets in the workplace and to realize the benefits that go along with it, such as boosting morale, reducing on-the-job stress and increasing the fitness levels of their employees. Obviously, not all businesses are a good fit for pets, but if you think your company may be interested in participating, talk to your supervisor or HR department and have them download the Free Action Pack from Pet Sitters International. It explains everything they need to know about Take Your Dog to Work Day. It also provides tips to make the event a success and other ideas such as how to turn the day into a fundraising event for a local shelter. If you’re a cat owner, don’t worry about being left out. The entire week from June 22-26th is Take Your Pet to Work week. 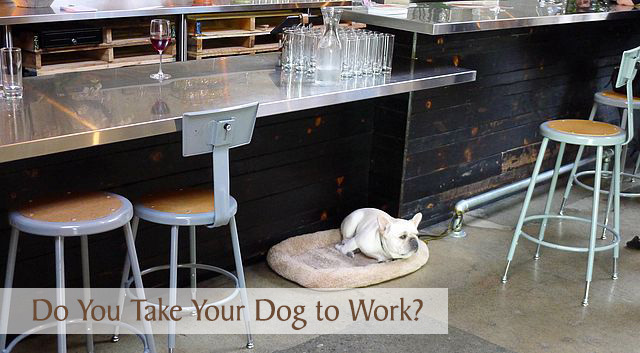 Are you able to take your dog to work? Do you think your dog would enjoy going to work with you? I would love to hear your thoughts and any tips you might have on how best to manage having your dog in the workplace. I used to take the girls to work with me when I worked at the vet clinic. They had their own crates there with their beds and they would hang out while I groomed. When I was done for the day we’d hit the dog park or some other hiking trail. It was nice to not have to drive all the way home to pick them up! That must have been really convenient to have them there with you, Lauren. They probably loved the end of the work day as much as you did so they could head out and have some fun at the park. Well since I work at home, I take my dogs to work with me every single day!!! Wish I could bring my dogs with me to work, but while the company I work for might be willing to allow people to bring their dogs, but I work in an urban high-rise office building and the building management will not allow dogs (except service dogs) in the building. Since most of my Humans’ work is done from home, I’m with them. My Human used to take my big sis Chessie to work when she went in Saturdays or Holidays. The VP frequently brought her Labs during the week. My Human says the one thing they always asked before hiring is how the applicant felt about large dogs. BOL! Somebody really couldn’t love us? Really? 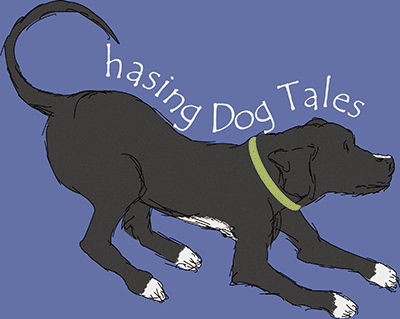 Did I tell you that I’ve relocated to http://www.browndogcbr.net? There is a link on http://browndogcbr.blogspot.com . Luckily I work from home most days. Kilo usually just snoozes beside me, but when it’s play time he makes a point to get my attention. don’t mind it though, a snuggle break is always a good idea. Absolutely, those breaks are good, especially for people that work at a computer for many hours a day. Snuggling or playing with the pup every now and then sure beats using a standing desk, lol! Even before I was a work-from-home-all-the-time writer, I worked from home (with a “real” job as a research analyst) for about 10 years, so for like the last 15 years it’s always “take your dog to work day” for me. If I had an office job though, there’s no way I could take Rita. She’s too afraid of certain things. She’d be barking at any loud noises and it would not be a good scene. We used to take the beagle to my hub’s office sometimes after hours and that was always a hoot! She would hit the ground running as soon as we went through the door. I don’t know what got into her – she would just start racing around the place. Pretty sure she was just going from cube to cube hoping to find a waste paper basket with some food in it! That would have been a funny site to see, your Beagle tearing through the office space. I wonder if Haley would eventually think of the cube space as her home and bark at any strangers lurking around outside the cube walls, lol! Before I retired (at least from “going to work”) I took Harley with me in the mornings. He was great! He laid under my desk, and tore paper all morning. Oh how I wish I could bring a dog to work with me. I hope to eventually work from home or in a dog-friendly environment. We live in Montana and the dog-friendly places are limited to Petco and the few outdoor patios that exist. I’m always amazed at the places we find that allow dogs when we travel. Hopefully, we will live in a place like that soon. What do you mean there are people that don’t like dogs? How is that even possible? BOL! Luckily, I am able to work from home so the boys stay with me all day every day. I love it and think the workplace would be better if everyone could have their best friend with them. Oh yes, those rare individuals that don’t like dogs. My favorite is an older lady we had the displeasure of meeting at a festival a few years ago. For some strange reason, Haley licked her arm as we walked by her and you would have thought Haley transmitted Ebola to the lady. That’s the only time Haley ever randomly licked a stranger, but she sure picked the wrong one to try that with, haha! Luckily, I work from home, so I have them with me all day, everyday! Isn’t it great when you have the opportunity to work from home? I wish more people had that option, their pups would be thrilled. I work in a highrise so I am sure the lease stipulates no animals. Just like dog parks where some owners are clueless, dogs (and their owners) at work have the potential to be very disruptive. Plus for the business, the liability is huge! I think it would bore my dogs to death. If they have to be bored, I think they would rather be in their own comfortable environment. Great point, Taryn. There are definitely some liability issues involved and the potential for conflicts between various dogs. I have a feeling Haley would be pretty bored most of the time too. Hmm, maybe those other people decided to sneak their dogs into the building. Not fair for Mr. N, everyone would love him! I agree, Leah! After all, they say a lot of young people aren’t having children and their pets are their children, right? I love the day but unfortunately my current job doesn’t participate. ( it’s a courthouse so maybe some of the judges don’t like dogs, who knows) I love that more offices and workplaces are becoming dog friendly; it really does boost morale. And on top of that so many people don’t adopt dogs because of their work schedule, ect. I couldn’t imagine how awesome it would be to know exactly where and what my dog was doing for 8 hours of the day. When I was 18 I worked as a manager at a gas station; while many thought I was nuts because I worked shifts alone I loved it because I’d bring in my dog Carter every day. He was a pretty chill dog so he didn’t mind at all; he had a nice set up in the back and he was a real velcro dog so it worked out perfectly. Didn’t keep the job long for other reasons but it was such a nice convenience. Nope, you wouldn’t want to sneak a dog into a courthouse and be found guilty by a judge that doesn’t like dogs, lol! Although, I have read several articles lately about therapy courthouse dogs that help people relax, so there’s an idea for Laika. I feel that I am extremely lucky that I can take my dog to work every day at the vet clinic I work at. Although, I still often feel bad because he does have to stay in a kennel all day. I do what I can to keep him active though: running in the morning, a quick walk at lunch, and a play/training session in the evening. No one is home at our house during the day, so it saves me from having to have a dog walker. It’s nice that you can spend that extra time with him each day rather than him being home alone. Do other people at the clinic bring their dogs too? Organizing a lunchtime play session would be fun! Elaine…A play session would be fun. We have to stagger our lunch breaks and my coworkers don’t always bring their dogs (different home situations then me). If they do though I always offer to take their dogs out with mine. Which both I and my dog enjoy immensely. Great post, and thanks for providing a link to PSI’s Free Action Pack. I’ll definitely share this post! I never had the opportunity to bring my dog to work as I always worked for large, traditional corporations in the financial industry. Now that I’m a blogger I work from home so I always have my girls with me… and I love it! I hope many more companies will recognize the morale and stress busting benefits of dogs in the workplace! Thanks for sharing the post, Cathy! There’s a lot of great information in the Action Pack and I loved their ideas for photo contests and fundraisers for shelters. I would think that might help some businesses see the value in participating from a PR perspective too. I’d strongly urge people to ask to take their dog to work. But you need to know it’s a good fit for your dog and your place of work. And you need to make a plan. When I brought Honey home, I was working full time. I wanted to socialize and train her perfectly from the beginning. So I asked my boss (who dislikes dogs) if I could bring Honey to work while she was a young puppy. I told him I’d bring a crate for her, not allow her to disrupt my work, ask my clients in advance if they were afraid of or allergic to dogs so I could make other arrangements for her, and take her home if she caused any disruption. He told me it was okay and that he trusted that I would deal with any issues long before anyone else had to say something to me. Most of my clients didn’t realize I had a puppy sleeping in a crate behind my desk (and once they did, it was hard to get them to concentrate on mortgage interest rates or closing costs). But it worked out great for a few months until Honey was old enough to stay home. So if my dog-hating boss approved it, I think it’s worth anyone else asking. Yes, I think it doesn’t hurt to ask and also have a plan that you can explain to your supervisor. You offer some great advice for anyone thinking about having that conversation. Thanks for the great tips, Pamela! I think my dogs would be happier and I would as well. Plus we have a really nice walking trail that runs along the building that would be perfect for our afternoon walk. I love it! When the boss is away, the pups get to play! The walking trail would be so convenient for you too since you walk Sampson and Delilah twice a day. It’s nice that you’re home with the pups when working on the blog and I can see the hassle and insurance issues if you were to take Missy and Buzz along when walking your client’s dogs. They probably enjoy having you all to themselves when you walk them too. Great post, I think everyone should get to take their dogs to work. I do because I work in a vet clinic. Something about a good pet to ease the stress of a day. Yours is such an amazing story, Lauren. It warms my heart to know that you’ve adopted Enzo and now he’s getting a lot of love from you and the youth at the shelter. The homeless youth are also getting the benefit of experiencing unconditional love and many of them have probably never had that in their lives before. You and Enzo are truly changing lives for the better and I wish you both the very best. Keep up your amazing work! ?